Recycled Stereo Plus: Marantz Model 2385 Receiver for sale! Marantz Model 2385 Receiver for sale! This Marantz 2385 Receiver was rated at 185 RMS per side and tested at 225 per side!!! As well built as any, as any vintage receiver!!! So well built you would be amazed at the power supply, caps and heat sinks. In the day, it was well over $1000 and today it would cost $5000 easy to build it with this quality!! A rare find in very good condition and a serious find!!! I think it in the very top receivers ever built, it's that good. These photos were taken before it is becoming fully serviced. Up for sale is a very hard to find Marantz 2385.. It comes in at 200 Watts per channel and weighs a ton! Huge Toroidal power transformer and storage caps the size of beer cans. Everything about this receiver just reeks quality. When you see it in real life you'll know what I mean. The volume control is not your typical Marantz volume control that you find on the smaller receivers, it is stepped so that you can have perfect control. I had this receiver hooked up to many speakers and I can tell you it literally rocks the house. The bass is probably the first thing you'll notice with this beast, it is very full and round !! This is one very powerful receiver. When the volume is up it makes my 120 watt receivers seem weak. It still maintains that typical Marantz sound but for some reason it sounds a bit more detailed in the highs than some of the others. Which I find a plus cause some of them can sound maybe a little too laid back. If you have hard to drive speakers than you should seriously consider this brute to power them. The reserves are endless. The condition of the receiver is really good. There are a few marks here and there but nothing significant. All the knobs are perfect. The receiver will not disappoint. All the lights work, there are no scratchy pots and it operates perfectly. FM stations come in perfect. INCREDIBLE BUILD QUALITY AND ENOUGH POWER FOR ANY SPEAKER SET WITH GREAT VINTAGE SOUND AND IT IS WAITING FOR A NEW HOME. 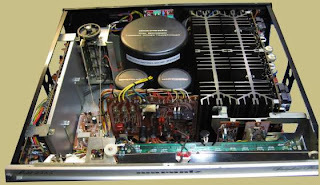 Marantz 2385 with top cover off, exposing massive power supply and heat sinks.